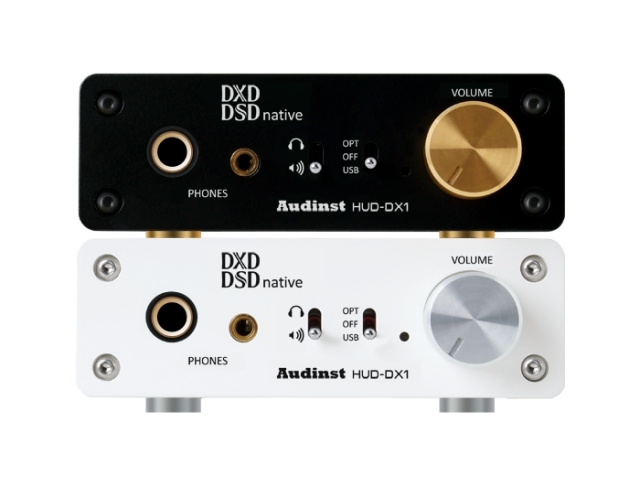 HUD-DX1 allows its users to enjoy high-level Hi-Fi sound world by supporting replay of high-quality DSD sound source (2.8/5.6㎒) in native mode using USB bus power alone, DXD sound source (352.8/384㎑), another high-quality sound format, as well as optical input (24bit 192㎑) and MQS (Mastering Quality Sound, 96~192㎑), Hi-Fi sound source, without any loss rendered in studio recording specification. 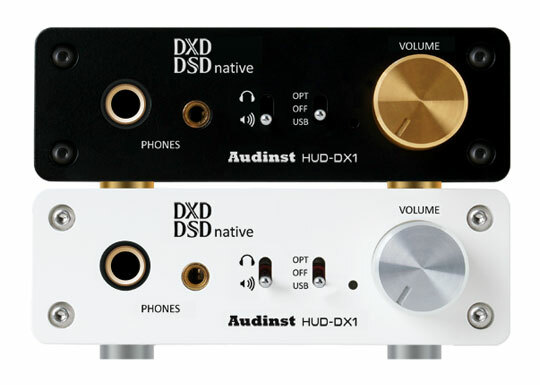 HUD-DX1 also allows its users to enjoy sounds with even higher output and high-quality sound when additionally connecting to the adaptor provided together. sophisticated shape with the assembly of silver knob and spike. sound output and play it back. Equipped with the newest USB 2.0 high speed audio controller from XMOS and ES9018K2M, a high performance DAC from ESS, it supports playback of Native DSD (DSD64 / DSD128) as it plays back sounds in excellent definition and Hi-Fi audio quality. Adopting the MUSES series OPAMP, a top class one specifically designed for Hi-Fi audio products by NJRC, HUD-DX1 uses MUSE8920 for its I/V converter and filter circuits for excellent matching in sound quality and optimum constitution that realizes high performance and high fidelity audio with top class sound balance and very low distortion, as well as ultra-low noise. 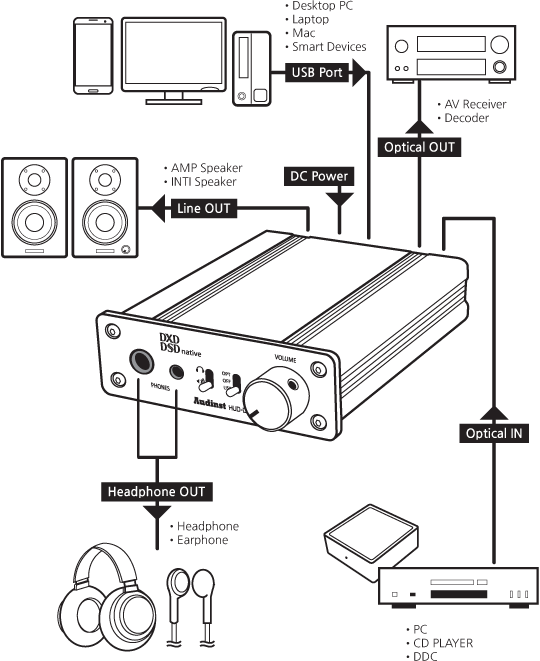 Also equipped with TPA6120A2, a high fidelity headphone amplifier from TI, it easily operates a headphone under 300 Ω in factory default mode and allows users to enjoy sounds with enough volume, even when using a 600 Ω high impedance headphone by removing jumper caps (JP1, JP2) set for headphone output gain. 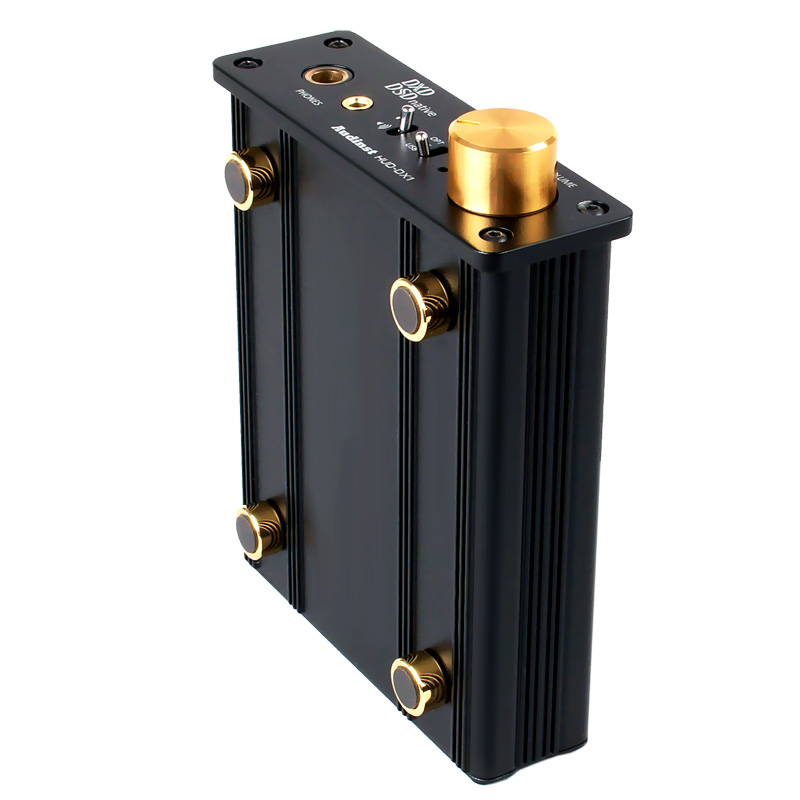 The high quality analog audio signals generated through the core circuits in the high-end specification and the multiple top class analog audio components are vividly delivered to the speaker and headphone to offer top class Hi-Fi sound environment. TCXO is made of an extremely thin crystal, creating peculiar vibration when applied with electricity. It is often used on resonance circuit to generate uniform frequency of electronic circuits. However, frequency error in which vibration counts of TCXO vary can arise depending on outside temperature, and such appearance can become a main reason for errors or frequency distortions on precision electrical equipments. In order to reduce frequency discrepancies due to exterior temperature, TCXO uniformly maintains interior temperature within crystal oscillator and fixates the frequency, making it an essential component for audio equipments sensitive to frequencies. The normal procedure to use the adaptor is make a connection to the USB port after making a connection of the adaptor, but it does not go out of order if this procedure is not followed since a protective circuit is embedded. It is normal to hear a distorted sound temporarily when you connect or disconnect the adaptor during use, since the distorted sound is a phenomena occurring when the protective circuit operates. To maximize user convenience and power efficiency, the power of this product is designed to be automatically on or off when the computer power is on or off, or when entering or releasing from the power saving mode in the case of using USB power. 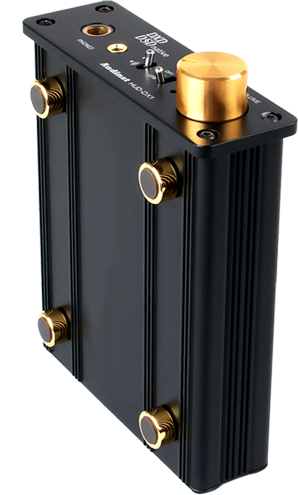 To operate a high performance dual power source type OPAMP, it is required to supply positive and negative voltage at the same time. 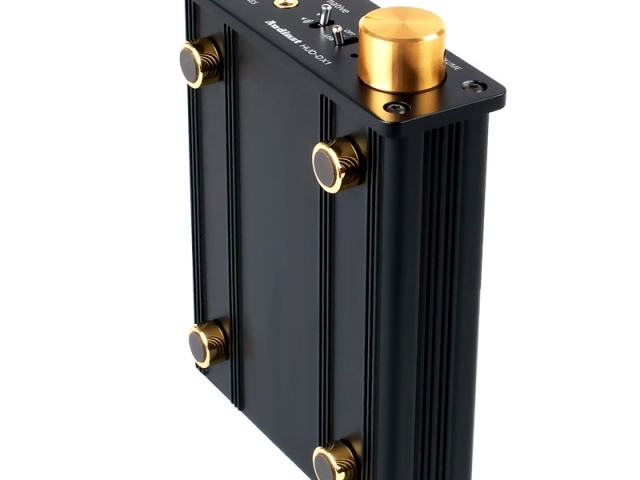 By supplying both voltages equally to the OPAMP circuit through the high performance inverter circuit after rectifying the power supplied via the USB port or an adaptor through an LDO regulator and low-ESR capacitor to obtain stable power of good quality with no noise, the rich and dense top class analog signals that can be achieved by a hi-end device can be generated. HUD-DX1 incorporated protective circuit system for the speakers & headphones, preventing any potential damages by temporarily cutting-off loud signals entering the speakers & headphones during the playback, when switching Input Toggle & Off Switch. This product can be operated under most computing environments using USB power without connecting the adaptor. But the adaptor has to be used when using power from bus power USB hub, laptop, low power computer that have unstable power from the USB port. Make sure to use the adaptor when using an iPad or a smartphone. To use a headphone with high impedance over 150 Ω, you have to use the adaptor to obtain the maximum output. 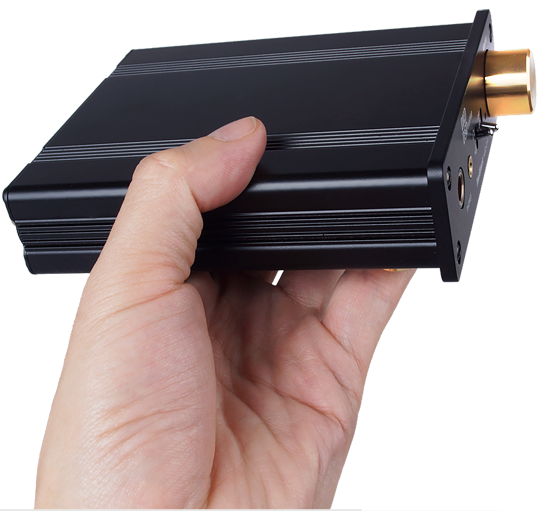 Typical hi-fi DAC is inconvenient to carry around due to its large size, yet USB DAC has the advantage of being small and lightweight for the purpose of using it connected to the computer. 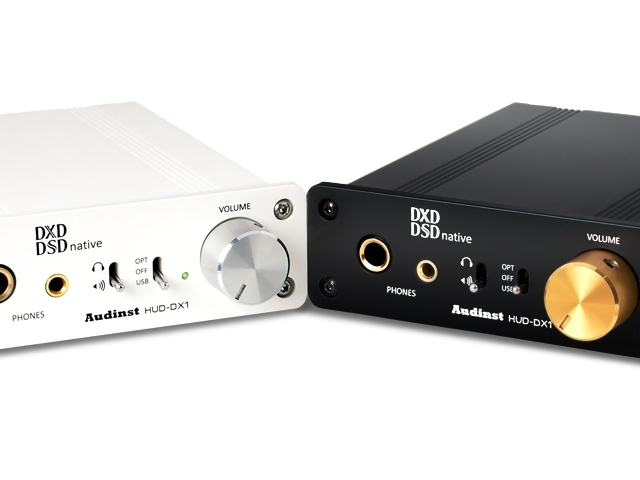 As the unit gets smaller, the function of DAC reaches its limit and sacrifices with low quality audio sound. 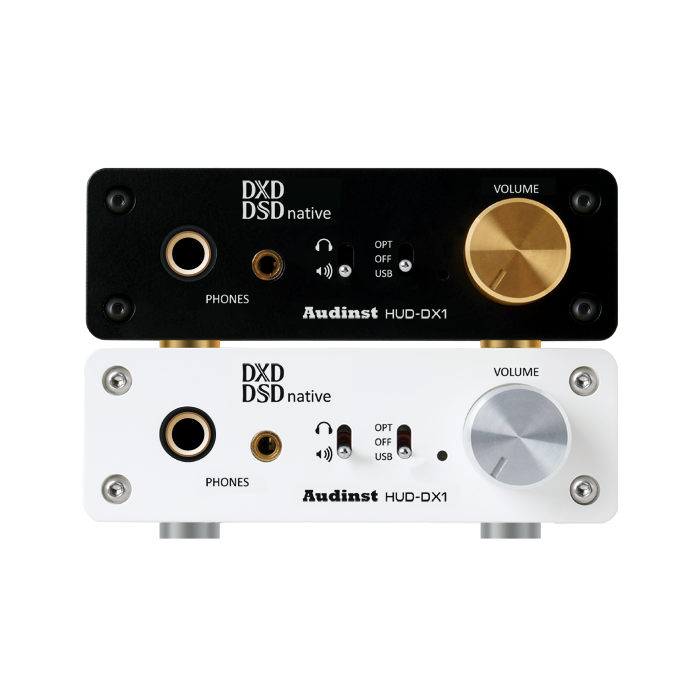 Our HUD-mx2 has overcome such limit to the maximum, developing ultra lightweight, compact DAC with reduced drop-off in audio quality. You can enjoy the music with highest quality possible audio sound wherever the computer is and, with its plug and play function. We adopted the driver from Thesycon, a German system software development company, by licensing to offer 100% functionality of high sound quality of Native DSD and stable audio playback. The Thesycon driver can be downloaded from the data center of the AUDINST website. Users can download it to an Internet-capable computer. HUD-DX1 also supports the connection with smart devices that support USB Audio. Finally, it also maximizes user convenience and power efficiency as it supports automatic power ON/OFF and power saving mode function when used with USB input. ※ Please refer to our website for the method of connecting to a smart device. 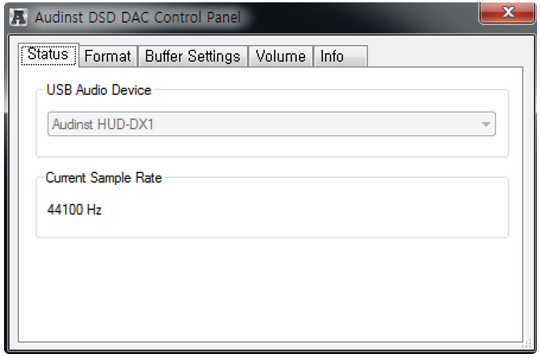 To fully utilize the performance of HUD-DX1’s USB audio, the specification of the system such as desktop PC or laptop has to be at a certain level. The level doesn’t have to be high necessarily but should not be too low. ※ RCA cable and program/driver installation CD are not provided with the product. The above product content is subject to change for the improvement of the product's functionalities. ※ The driver for Windows can be downloaded from the data center of the AUDINST website. Users can download it to a computer.